The plan is also consistent with the NASA Transition Authorization Act of 2017, which approved of $19.5 billion in funding for NASA for fiscal year 2017. This act sought to maintain transitional funding in order to ensure that NASA can continue planning its return to the Moon, send astronauts to Mars, as well as maintain a continued commitment to the International Space Station and the utilization of Low Earth Orbit, and other related space ventures. When it comes to operations in LEO, NASA intends to transition from the current model to one where the government is one of several customers for commercial services. In short, NASA intends to transition from direct government-funding to commercial services and partnerships. This aspect of the plan will also involve independent commercial platforms or a non-NASA operating model for the International Space Station by 2025. In the meantime, the ISS will continue to function as a core long-duration human spaceflight platform until at least 2024. It will also serve as a testbed for developing strategies to keep crews healthy and productive on deep space missions, and to develop technologies in support of those missions – i.e. advanced robotics, communications, medicine, agriculture and environmental science. The space station is also expected to play a key role in enabling the transition to commercial activities in LEO. These are likely include the deployment of broadband internet satellites, CubeSats, research platforms, non-government space stations and habitats, and maybe even a space hotel or two! Intrinsic to this are the planned lunar missions that will rely on the Space Launch System (SLS) and the Orion Multi-Purpose Crew Vehicle (MPCV). 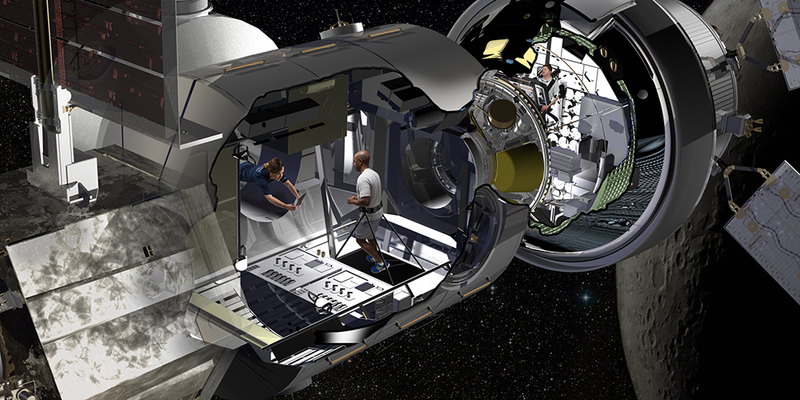 The first mission to test the Orion capsule (Exploration Mission-1) – which will take place in 2020 – will consist of an uncrewed Orion capsule being sent into orbit around the Moon and then returning to Earth. This will be followed by Exploration Mission-2, which will consist of astronauts orbiting the Moon in 2023, with a crewed mission to the lunar surface happening no later than the late 2020s. This will be the first time that astronauts have traveled to the Moon since 1972. It will also leverage international and commercial partnerships to develop a long-term human presence on the Moon. Another major goal involving the Moon is the construction of the Lunar Orbital Platform-Gateway (LOP-G), formerly-known as the Deep Space Gateway. This orbital habitat will allow for longer stays on the lunar surface, to navigate to different lunar orbits, and easier returns to Earth. It will also act as a safe haven in the event of an emergency on the surface, such as a meteor strike. 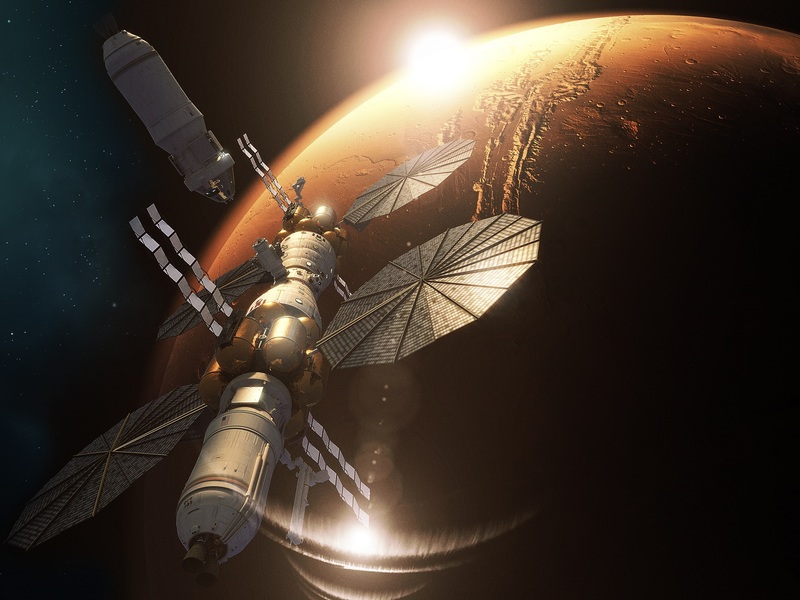 Consistent with NASA’s “Journey to Mars“, the Gateway will also validate key technologies and systems that will go into the Deep Space Transport (aka. Mars Transit Vehicle) – the spacecraft which will take astronauts to Mars. By the late 2020s, a lunar lander will begin making trips to the surface of the Moon, where astronauts will train for an eventual mission to the surface of Mars. Last, but not least, the Gateway will serve as a laboratory for testing the effects of microgravity and radiation on living organisms beyond LEO. These experiments will prove vital to conducting deep space missions to Mars and beyond. This platform will be assembled in space incrementally with the first element (the power and propulsion element) being launched by 2022. And then, there is the plan to send astronauts to Mars, which NASA still hopes will happen by the 2030s. For this part of the plan, the focus is on the development of key robotic and human missions that will extend lessons learned from lunar missions to Mars. The plan also involves several missions which are already en route to Mars or currently in development. These include NASA’s Interior Exploration using Seismic Investigations, Geodesy and Heat Transport (InSight) mission, which is due to land on Mars this November and will study the interior of the Red Planet. Meanwhile, the Mars 2020 rover is still in development and will launch by July of 2020. Once it arrives on Mars, this rover will extend the search for past life on the Red Planet and demonstrate how local resources can be used to aid in exploration. According to the Campaign Report, the Mars 2020 mission also will also serve as a building block for a subsequent round-trip robotic mission. Essentially, this mission will involve landing a rocket on Mars, retrieving the samples obtained by the Mars 2020 rover, then returning them to Earth. It will also serve as a critical precursor to an eventual series of crewed missions to Mars. Another key point in this part of the plan is the creation of orbital infrastructure that will allow human missions in orbit around Mars and to the surface. Already, NASA has contracted with Lockheed Martin to develop the Mars Base Camp concept, which is similar to the Gateway in that it will remain in orbit around Mars, have its own lander vehicle, and will facilitate missions to and from the surface. For more information, check out the National Space Exploration Campaign Report. Previous PostPrevious Technosignatures are NASA’s New Target for Detecting Other Civilizations in Space. Wait. What’s a Technosignature?